Analytics dashboards help you see and detect changes in your API ecosystem at a glance. The ability to see what has changed over time helps you identify problems and take corrective action quickly. For a quick overview of Analytics Services, who uses them, and why, see Analytics Services overview. For a quick overview of the analytics dashboards, watch this video. Note: There is a limit to the amount of data that can be reported in the Analytics dashboards. If the amount of analytics data returned by the query exceeds this limit, then the dashboard will display the results for a partial set of data and a warning will be displayed on the dashboard (Public Cloud only). As an alternative, you can export analytics data from Apigee Analytics to your own data repository, such as Google Cloud Storage or BigQuery. You can then take advantage of the powerful query and machine learning capabilities offered by Google Cloud BigQuery and TensorFlow to perform your own data analysis. See Export data from Analytics for more. What can you learn from the dashboards? 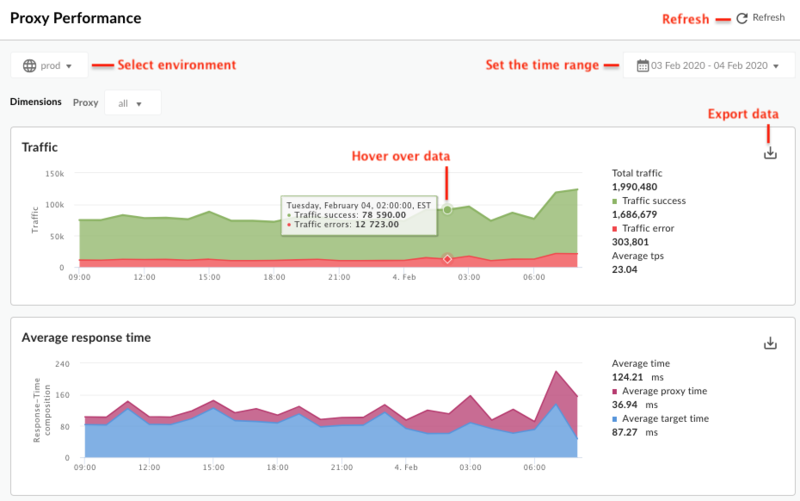 Has there been a sudden spike or drop off in API traffic? Which app developers are most successful? What is the adoption rate of your API among developers? Which API methods are most popular? The Edge Analytics dashboards are designed specifically to answer questions like these. In the background, Apigee Edge collects information as data passes through your APIs. The dashboards provide a powerful way to use this data immediately. If you see something of interest in a graph or chart, an anomaly or sudden change, you can then drill deeper to uncover as much detail as you require. If you notice that a particular developer is experiencing a lot of errors or a sudden drop in traffic, you can contact that developer proactively. Dashboards give you insight into your APIs that allows you to take action. What's the delay interval for receiving data? Can I customize the dashboards? Yes, many dashboards let you select which metrics to analyze, date ranges, data aggregation intervals, and many other variables. If the built-in dashboards do not suit your needs, you can create custom reports, which are dashboards you create by selecting the analytic dimensions and metrics that you wish to analyze. Custom reports let you "drill down" into your API's analytic data until you achieve the granularity you require. What are the most common features in the dashboards? 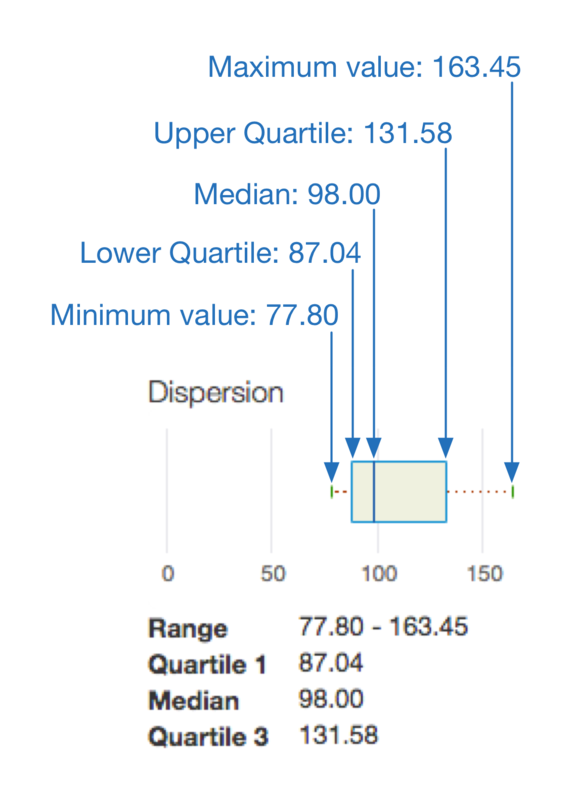 Dashboards have a set of common features, including setting time range, click and drag zooming on charts, mouse-over hover for more details on charts and other regions, and selectors for choosing the data to display in a chart. If you understand how to use one kind of dashboard, you'll be comfortable using the others. Note: For the specific features of each dashboard, view the documentation for that dashboard. Set the time range - Set the time range over which the dashboard displays its data. Select Custom to use a calendar-style date picker to select the interval. If you select Custom, you can also set the aggregation or "granularity" of data to display for the selcted time range. For example, if you choose to display data for a seven day period, you can aggregate the data to display by hour or by day. A shorter aggregation interval results in a larger dataset displayed by the dashboard. Therefore, performance can improve when you select a longer aggregation interval. For example, performance is better when you aggregate by day rather than by hour. Note: For Cloud-based installations, data older than six months from the current date is not accessible by default. If you want to access data older than six months, contact Apigee Support. Refresh - Refresh the dashboard data. Environment - Select the environment in the organization. Zoom in - You can zoom in on chart data by clicking and dragging a region of the chart. When you complete the drag, the chart zooms in to the selected region. Export data to file - Click Combined CSV to download a single CSV file that contains a combined set of data from all charts on the page. Alternatively, click CSV adjacent to a chart to download data specific to that chart only. Hover mouse over graphs - You can mouse over any point on a graph for more context about the data at that point. The area within the box indicates the most typical average target response times experienced by your traffic — 50% of your traffic, to be exact. The line extending from the left side of the box indicates the average target response times experienced by 25% of your traffic. The line extending from the right of the box indicates the average target response times experienced by the remaining 25% of your traffic. The longer these lines, or “whiskers,” the more extreme your outlier values. What is the Apigee Edge dashboard in the Classic UI? The Apigee Edge dashboard is the first thing you see when you log in to the Edge Classic UI. It gives you a quick overall view of your API program -- patterns for API traffic, developer engagement, and developer apps. And, you can drill in on each chart for a more detailed view. You can see this dashboard anytime by selecting Dashboard from the main Apigee Edge menu. Note: The Apigee Edge dashboard is available only to users of Classic Edge. The dashboard is not currently available in the New Edge experience. All the API traffic for an organization over the selected period of time. Traffic, also called "throughput", represents the number of API requests and responses seen by an API organization. Click the Proxy Performance link to drill down to a more detailed view. Measures the average number of API calls for registered developers during the selected period of time. Shows you active and highly active developers (greater than 50 transactions per hour). Also shown are the total number of developers who have signed up to use your APIs. Click the Developer Engagement link to drill down to a more detailed view. Note: It's possible that the Developer Engagement could reflect higher numbers for a Week timespan than for a Month. This is because engagement is calculated based on the average number of calls during a specific period of time (week/month). You could have a large number of developers register their apps, but for a period of time the apps are not generating traffic (perhaps because their apps are still in development). If traffic starts later, in the most recent week, then calculated engagement will be higher for the most recent week than over the previous month, because most of the traffic was generated in the most recent week. 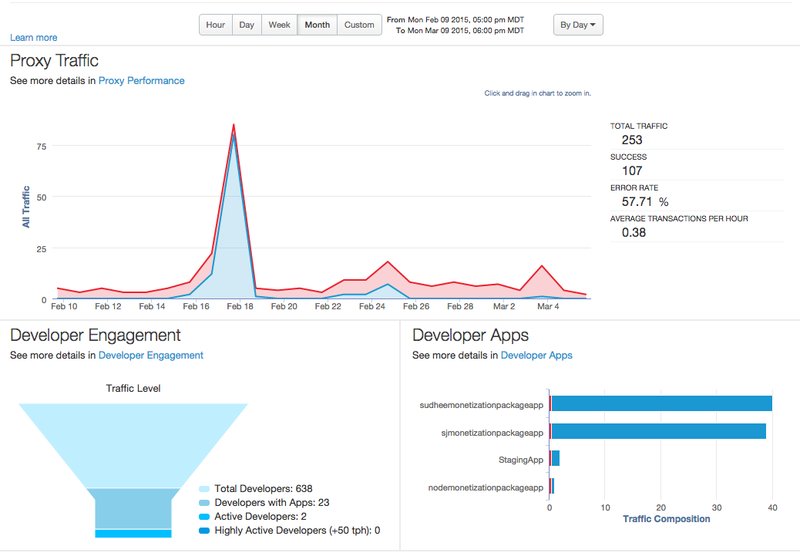 Traffic for your top-performing developer apps for the selected time period is displayed in this chart. Click the Developer Apps link to drill down to a more detailed view.